Coral researchers are remobilising to conduct aerial and underwater surveys along the Great Barrier Reef and elsewhere in Australia as coral bleaching reappears for the second year in a row. The decision coincides with the release today of a study in the prestigious journal Nature warning the Reef's resilience is rapidly waning. "We're hoping that the next 2-3 weeks will cool off quickly, and this year's bleaching won't be anything like last year. The severity of the 2016 bleaching was off the chart," explains lead author and Taskforce convener, Prof. Terry Hughes (ARC Centre of Excellence for Coral Reef Studies). "It was the third major bleaching to affect the Great Barrier Reef, following earlier heatwaves in 1998 and 2002. Now we're gearing up to study a potential number four." "We have now assessed whether past exposure to bleaching in 1998 and 2002 made reefs any more tolerant in 2016. 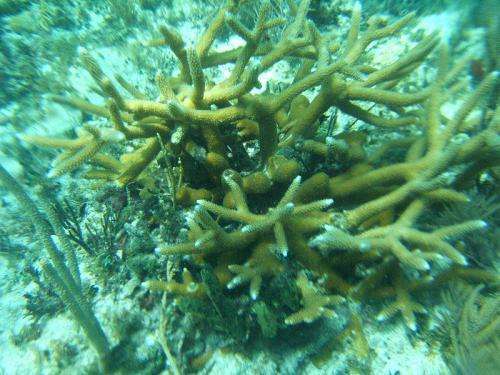 Sadly, we found no evidence that past bleaching makes the corals any tougher." Co-author Dr Janice Lough, Senior Principal Research Scientist at the Australian Institute of Marine Science says, "average sea-surface temperatures for the Australian summer 2016 were the highest ever recorded on the Great Barrier Reef. In each of the three events since 1998, the pattern of bleaching matches exactly where the warmest water was each year. That allows us to predict when and where bleaching is likely to occur this year." Global warming is the number one threat to the Reef. The bleaching in 2016 stronglyreinforces the urgent need to limit climate change as agreed by world leaders in theParis Agreement, and fully implement the Reef 2050 Plan to boost the Reef's resilience,"says co-author Dr David Wachenfeld from the Great Barrier Reef Marine Park Authority. "It broke my heart to see so many corals dying on northern reefs on the Great Barrier Reef in 2016," says Prof. Hughes, who led the expansive aerial surveys. "With rising temperatures due to global warming, it's only a matter of time before we see more of these events. A fourth event after only one year is a major blow to the Reef". Why not do something instead of just studying? Seriously, the cost of anchoring floats over the reef that were designed to throw up spray (powered by wind, waves, and currents) to cool the water. (Even if the air temperature is higher, evaporation would cool the water.) Proper design of the buoys wouldn't even need electricity. And they could be collected an refurbished if necessary during the southern winter. Another idea would be to tow icebergs north from near Antarctica. The problem is that the seas north of Antarctica are called the roaring forties, the furious fifies and the screaming sixties with good reason. Testing the buoy idea shouldn't be too expensive on say a kilometer long stretch of the Great Barrier Reef. There are lots of South Sea islands which would certainly be interested in this technology if someone were to develop and test it. Interesting idea, but it is a temporary and localized treatment of symptoms of the real problem. It is much, much better to do something positive than to do nothing. Of course, doing the wrong thing is worse. For example, if you want to use photovoltaics, large roof panels, especially where I live (New Hampshire), may use more energy than they ever produce. Hot water heaters on the roof? Those actually work around here and are much cheaper. But what you really want to do is buy solar arrays connected to batteries and LED lights, then send them to Africa. Replacing kerosene lanterns with solar powered LEDs is a huge win, and a side benefit is the reduction in cancers and other illnesses caused by kerosene fumes and particulate carbon. how deep would that effect go? how deep is the area and how much energy would be required to alter the temperature considering the constant heat inflow by current? how would that affect the species living on the reef? what would happen if it cooled too much on accident? would that cause a similar problem to what is happening now? I agree with the Captain. It would be foolhardy to play God. It is better to let nature take its course. If the reef can not survive then other life forms more suited to the warmer waters will rise up. We could cause much more harm by playing around with the environment and end up with terrible unexpected consequences.